You can choose from one of our already popular East Coast packages or Build your own. We can build an East Coast Packages and save you money on tours. Our massive buying power can save you heaps and our experienced team of travel experts can guide you on the best places to visit, what's hot and what's not on the East Coast! 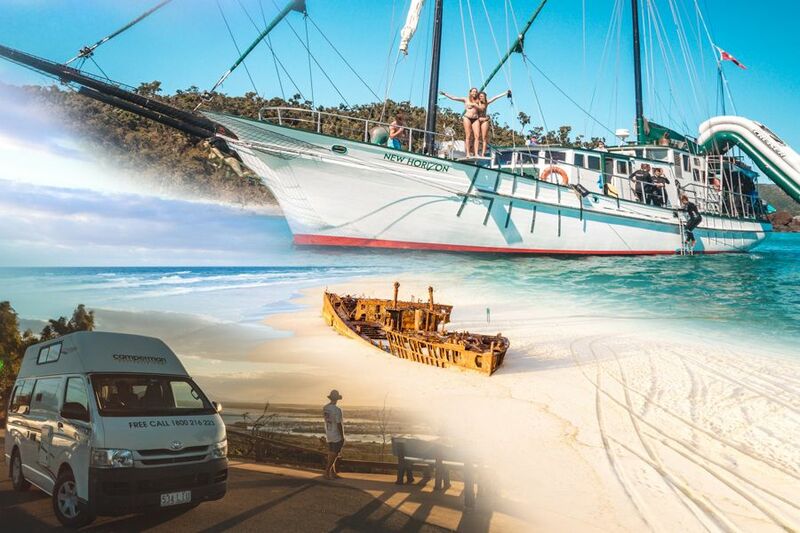 Nomads Fraser Island gives you the opportunity to experience the world's largest sand island with this amazing and fun self-drive tag along tour! For three days and two nights you will explore Fraser Island in your 4WD, following your guide to the most amazing parts of the island. By day you will explore places such as Lake Birrabeen, Maheno Shipwreck, Champagne Pools and the Pinnacles, while spending your evenings relaxing at Eurong Resort on Fraser Island! Dropbears Tag Along Camping Safari. See the best that Fraser has to offer, as well as the classic highlights of Lake McKenzie, Champagne Pools and Indian Heads. You will also get the chance to visit those hidden wonders that are so often overlooked by other tours. With all camping gear, tents and main meals included, you can spend more time exploring and admiring the natural beauty of this paradise island. This tour promises local knowledge and guarantees each trip is tailor-made for each tour group. Sleep under the stars, eat great meals, drive around the island and more on this great Fraser Camping Safari. Cool Dingo Guided Tour on Fraser Island gives guests the opportunity to explore the wondrous beauty that is Fraser Island on this fully guided tour - perfect for friends, couples and the young at heart. With comfortable accommodation at the Wilderness Lodge and delicious meals provided throughout the trip, guests get to experience the 4WD sand island adventure while being able to sit back, relax and enjoy the ride. 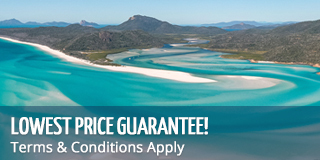 Atlantic Clipper offers 2 fun days and nights of touring the Whitsundays to make one unforgettable trip! Perfect for those for looking the time of their life at sea, Atlantic Clipper is one of the most social tours in the Whitsundays with 53 passengers per trip and at 111ft, it's also one of the biggest! This mega yacht was built in 1983 and combines the awesome adventure of sailing, snorkelling and scuba diving with modern facilities and air conditioning throughout. The Clipper also boasts a fun itinerary that will bring you to some of the most beautiful and iconic destinations in the Whitsundays! Atlantic Clipper is undoubtedly one of the most fun and social tours in the Whitsundays and is perfect for the young, young-at-heart and adventure-driven traveller! New Horizon is the ideal trip for those with a sense of fun and a craving for adventure! Being one of the most popular tours on the East Coast of Australia, backpackers travel from all corners of the globe just to take part in this once-in-a-lifetime Whitsunday adventure that will have you laughing, exploring and making memories to last a lifetime! Snorkel or dive amazing coral reefs, take an exhilarating ride on a jet boat, "walk the plank", zip down a mega slide, or paddleboard around secluded bays - New Horizon has it all! This is just the start of the activities you can get your hand on while sailing the Whitsundays on New Horizon! Powerplay is a two day and two night fun-filled adventure! Spend some time in the sun, and enjoy exploring the beautiful Whitsundays Islands, as well as spending an afternoon at the world famous Whitehaven Beach and Hill Inlet Lookout for unbeatable views. Get up close and personal with the Great Barrier Reef Marine Park, getting a chance to snorkel and enjoy the beautiful fringing reefs of the Whitsundays! This two night tour takes out a total of 18 passengers, making it the perfect place for socialising, relaxing and exploring. Check out our video below to see what a trip on Powerplay is all about! Juliette 3, which is suitable for 2 to 3 people, is the ideal mode of transportation if you are seeking a getaway with plenty of comforts. The vehicle has plenty of space and all the necessities you need to be self-sufficient. And where ever you go, is your choice! Juliette 5 Budget Campervan Bring along the whole squad! This campervan sleeps 3 inside the van, and 2 in a tent, making enough room for the whole crowd. We will provide everything you will need during any road trip around Australia. Enjoy the thrill of the ride with your own campervan. Premier Motor Service offers passengers the chance to explore Australia worry free! With routes running from Melbourne to Cairns, guests can get to where they need to go with Premier and feel confident about their choice of travel. Allow us to get you to where you need to go safely and on time, with your budget in mind! Bussing is one of the most cost effective ways to see this beautiful country and allows you to see all the amazing scenery and towns on offer along the way. The hop-on, hop-off option allows passengers to stop along the way and enjoy the towns and cities along their travel route. Take time to explore, even staying a few days or nights before getting back on the bus and continuing your journey! The direct travel option is ideal for shorter routes where guests will get to where they need to go faster. Nomads Noosa Resort is located right in the heart of Noosa and only 800 metres from the beach and famous National Park. Nomads Noosa has newly renovated 8, 12 & 16 share dorm rooms (twins & doubles upon request) and is surrounded by tropical gardens in the heart of Noosa and only 800m to Main Beach. The facilities includes free parking, and a courtesy bus which will pick guests up from the Transit Centre. It is also home to the World Famous 'Kamel Bar and Restaurant' is onsite which is Noosa's #1 Party Bar - the perfect way to meet new people! Flashpackers Hervey Bay offers affordable luxury accommodation, perfect for backpackers wanting a little more. Being small in size, Flashpackers thrive on prioritizing their guests needs, ensuring their stay is the very best it can be. With palm-shaded patios and tropical outdoor courtyards, the hostel gives a modern and relaxed atmosphere, whilst also keeping the much loved spirit of communal experience of traveling. Whether you choose an eight bed dorm or a private queen ensuite, all rooms provide outstanding comfort. Chill out by the pool with its very own sandy beach or fire up the BBQ with new friends around the outdoor lounges. Why not relax and watch one of the many free movies in the cinema before retiring to your room, with Hotel-grade orthopaedic mattresses to boot! Base Backpackers Airlie Beach quality service, cleanliness and guest satisfaction are all top priority. Base Backpackers offers a range of accommodation styles to best suit your needs and budget! As a top Australian destination, Airlie Beach provides the perfect base for a most memorable holiday, surrounded by 74 islands and one of the worlds Top Ten Beaches, Whitehaven Beach. Base Resort offers 4 to 5 share dorms all featuring an ensuite, fridge, air conditioning, and fresh linen. Double, twin and triple rooms are also available featuring an ensuite with large spa bath, fridge, TV and airconditioning. Our team of experts, take the hassle out of East Coast packages. We do the leg work, so you can enjoy your holiday experiences. Whether its Surfing in Byron Bay, Horse riding on the beach, Skydiving over the Whitsundays or Bungy in Cairns, there is not much we can't add to this tour to make it just perfect for you! Just live chat with us now! All departures and itineraries are subject to weather and may be changed or cancelled at the discretion of the operator. It should be noted that adventure travel involves risk. Whilst we make every effort to safeguard clients, we cannot be responsible for personal injury or loss due to actions of our clients which are beyond our control. We recommend that all clients have travel insurance covering illness, injury, loss or damage to personal belongings and not being able to travel on the confirmed date of departure. Please be aware operators pass on credit card merchant fees so there is a non-refundable 2.5% surcharge for VISA, MASTERCARD and AMEX card purchases. All client cancellations forfeit 25% of total ticket price and all client cancellations made less than 21 days prior to departure will result in complete forfeiture of the full price of the sailing holiday. In the case of a booking made that has an outstanding balance to pay on arrival then your credit card details will be passed on to the accommodation to secure your booking. If the tour operator has to cancel the trip (prior to the trips departure) and we cannot offer a suitable alternative, then a refund will be given minus card fees. We strongly recommend that you have travel insurance, especially during the wet season. "I just said what i wanted and it was all organised for me! The boat trip was fun and my Fraser self drive tour was awesome!I would recommend this to all East Coast travellers."